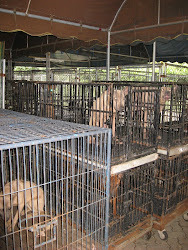 In case it is not obvious and to save you from reading the rest of this site (blog), Jack Sterling operates a puppy mill in Chiang Mai, Thailand, where until recently he had over 100 teenage & adult dogs that were left over from too many litters and many were not of pet or salable quality. He also had over 40 puppies and their health was priority 1 for Sterling as they are his livelihood, so the adults were forced to go without food, only being fed 2 - 3 times a week. His factory was reminiscent of a prison with cages stacked row after row and dogs kept inside without essential socialisation and exercise. Neighbours alerted the police on several occasions regarding dogs left hanging to die in his garden tree and eventually a local animal welfare group managed to motivate the justice system to bring about a charge for a case of cruelty to a puppy which resulted in it's death. 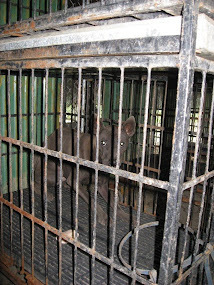 There are no government or other active agencies effectively chasing cruelty cases in Thailand and the organisations that exist in many western countries , RSPCA, ASPCA etc. just do not exist. Legislation in fact is so inadequate that to be caught smoking in a public place, or throwing away a cigarette end, attracts a fine of approximately 60$US. Cruelty to animals attracts a fine of just 30$US. This week he turned 61 and is still intending to operate his puppy mill, just as he has in the USA & now in Thailand for the past 15 years. Of course he will, it's a lucrative business. And that's where the likes of PuppyFind.com, NextDayPets.com & now PuppySite.com enter this story.Sadly, despite writing & corresponding with PuppyFind.com, NextDayPets.com & now PuppySite.com, regarding Sterling's conviction, each site continues to advertise Jack Sterling - House of Sakorn as a breeder. These adverts do not advise potential customers of Jack Sterlings conviction for cruelty and other background information which they might wish to know before entering into a life long contract with Jack Sterling, following their initial contact with him. 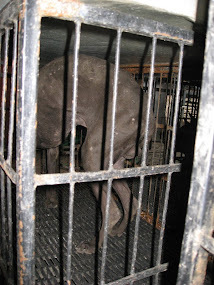 TRDTruth is not about closing down the puppy breeding market or against breeders. Puppies bred in moderation, by the majority of breeders throughout the world, are not puppy mills. But Jack Sterling is churning out so many puppies and as a consequence, he has flooded & spoiled the market for many other Thai Ridgeback breeders in Thailand & Internationally. Furthermore, he has caused a more serious problem locally. There are already too many dogs on the streets of Thailand where he is generating many non pet quality dogs that will inevitably end up either being dumped by him at a temple, with a willing vet or just left on a street at night to find it's way in life. In the past, he has even tried dispatching non salable ones as gifts to unsuspecting customers, only to find they have birth defects or other problems they did not buy into when ordering just 1 puppy from him. If you feel strongly about animal welfare, the future of any dog or the ethics of allowing Jack Sterling to continue to operate a puppy mill, say something, do something, do not just turn away, hoping nobody saw you turning away, to leave the future unchanged.